We have a treat for you! 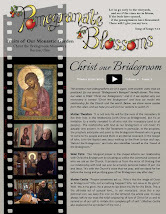 Mother Theodora would like to share her vocation story! Enjoy! I think most of my family thought I was nuts, along with many of my friends and coworkers. Why would I do such a thing? Why would I abandon my lifelong dream of being a wife and mother? Why would I leave my career and give up all the things I worked so hard for: my car, my apartment and everything in it, my vacations and travels, and so-called “independence”? Why would I, at age 35, who lived on my own for ten years, feel uneasy—and yet drawn—to live with a group of women whose life experiences were much different than mine? Something in my life was missing; there was something “more.” In the deepest core of my being there was a vacuum that ached to be satisfied, but no person, no thing, no situation seemed to relieve the ache. I know now that ONLY God can fill this vacuum, and looking back on my life, I realize that He was patient with me and was constantly nudging and forming me all along. I pondered this thought with each encounter with the Bible. One day, a horrifying thought paralyzed me as I pondered over the pictures. “What if God is ugly? What if He looks like a monster? !” I sat on the floor thinking for quite a while, unsure about what it all meant. I finally got up and put the Bible back in its place and started to leave the room in an uneasy and somewhat nauseous state. As I passed through the doorway, I stopped in my steps and said to God, “I would love You anyway.” This must have pleased Him immensely, because I can remember a sense of joy rushing through me as I walked through the hallway. As time passed, I continued to browse through the pictures and eventually started to read about them. When I was about twelve the thought of religious life began to attract me. I talked to my pastor who must have mentioned it to my mother. 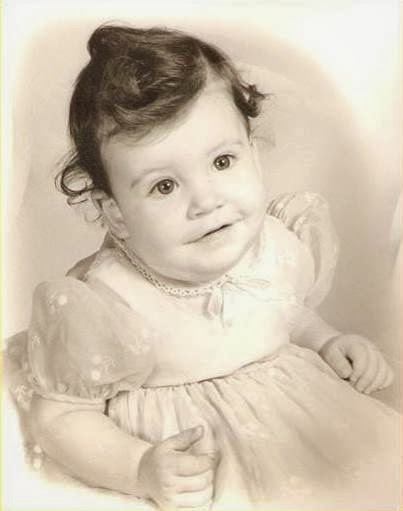 One day, my mother and I were alone in the car and she surprised me with the question, “Why do you think you want to become a nun?” At the time, the only thing that I could put into words was, “Because someone out of the eleven children should.” She hesitated and then very wisely told me that that should not be the reason, and that I should pray about it. I did. When I was 16, I met a sister of Saint Basil the Great during a pilgrimage at Holy Trinity Monastery in Butler, Pennsylvania and we kept in touch through letters. At 18, I “tested the water” by visiting a couple of convents, but the experiences dissuaded my consideration of entering. Through several years of retreats and pilgrimages at Mount Saint Macrina, I developed other relationships with the Sisters of Saint Basil the Great. The thought of religious life crossed my mind again at age 22, but I instead became a dance instructor. I really wanted to be married and have twelve children, and I dreamed about being the perfect wife and mother. I learned how to cook, bake, sew, garden, can and other homemaking skills. Being number five of eleven children in a three-bedroom home provided a lot of hands-on experience with children. I went to work, puzzled at what had happened. I was preoccupied with the words, “Let Me.” Instead of constantly saying, “Jesus, help me,” I found myself calmly saying, “Okay.” After work I contacted a close friend who was a priest and told him that I needed to talk. After all the talking and discerning, he smiled and replied, “I saw it coming.” His words were intriguing and somewhat reassuring, but I was still anxious and unsure. I purposely took the next day off from work and stayed home. I disconnected the phone and I kept silent and prayed throughout the day. Somewhere within the silence of that day, I realized that I surrendered my resistance and said, “Yes” to God’s invitation. I found myself smiling uncontrollably. The relentless, deep, aching vacuum that nothing seemed to satisfy was now filled with an exciting peace and joy that I had never experienced before. 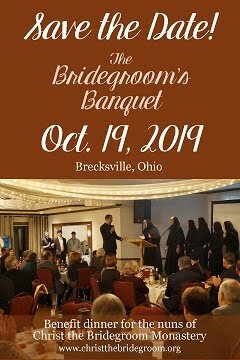 This peace and joy gave me the desire and courage to write a letter to the Sisters of Saint Basil the Great in Uniontown, Pennsylvania requesting entrance into their community. I waited for their response. I was accepted and began the formation process, which is another story in itself. I was a Sister of Saint Basil the Great for thirteen years. I love my sisters and will always be grateful to them for their loving witness and all my experiences within those years. While being a Sister of Saint Basil the Great, I experienced their various ministries. Youth ministry was “my love” and I ultimately became the Director of Youth for the Archeparchy of Pittsburgh. Years passed and I loved what I was doing, but that familiar “nagging” stirred again. “Now what?” I thought to myself. Did God place that “something more” in my heart again?—more with youth ministry?—more with my religious vocation? I kept praying about it and tried to listen and follow whatever Christ was calling me to do. I remember the first time I read Blessed John Paul’s Orientale Lumen. I was attracted to and edified by his call for the restoration of monasticism in the Eastern Church. I often questioned if it was even a possibility for me to embrace such a call, but tried to keep my heart open to Christ’s lead. 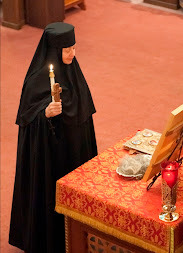 In 2008, Bishop John Kudrick published a document based on Orientale Lumen, which expressed his vision for monasticism for the Eparchy of Parma. With much ardent prayer, hours of spiritual direction and discernment, I believed that God was asking me to let go of what was familiar and comfortable. I did not want to hurt my sisters, and how could I leave “my kids” in youth ministry? It was an extremely difficult and gut-wrenching decision, but I was compelled with an unexplainable desire to fulfill God’s will, whatever it may be, wherever it would lead, whatever it would cost. I requested a leave of absence from my community for one year. On December 5, 2008, I signed the official documents of exclaustration (leave of absence) from Rome and then had to leave behind my habit, community cross and wedding band. My sisters showed me great love and prayerful support especially at my departure. 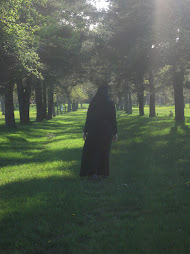 My heart was overwhelmed with physical pain as I drove off the property of Mount Saint Macrina. The drive to the Eparchy of Parma was a rollercoaster of erratic emotions. At one moment I was filled with wonder and excitement and a sense of relief that the initial separation was over, then I would cry in pain, then I was filled with screaming laughter, then a moment of panic would overwhelm me, then I was singing praises to God and the cycle would start all over again. It was crazy, but through it all I felt Christ’s embrace and was filled with great joy and peace. I arrived in the Eparchy of Parma endeavoring to start an Eastern monastic community. Again, the familiar question, “ARE YOU NUTS? !” resurfaced in my heart. What was I doing?! I heard many first and secondhand remarks that I was crazy; I was too old; the economy was terrible and not favorable to start anything like a monastery, especially in the United States, where the counter-cultural life of monasticism is reproached with indifference or opposition. I dwelled on these very same issues. Heck, I didn’t know what I was doing, but I was convinced that it was God’s will and He would guide me and not abandon me. My temporary home was the vacant rectory at my home parish, St. John the Baptist in Solon, Ohio. 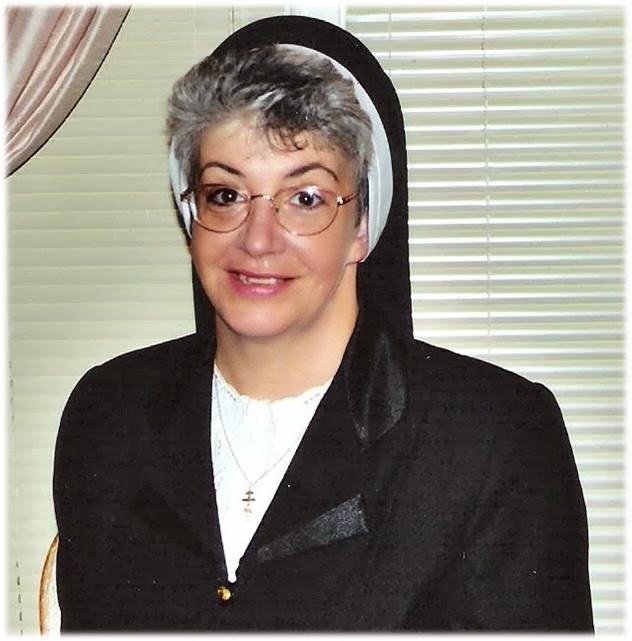 Sr. Cecilia, then Julie Hritz, later moved in with me. We tried to keep a rhythm of daily prayer and fasting as we worked diligently on the improvements of the house that was graciously given to us by the Social Mission Sisters, Sister Flora and Sister Adalberta. The hard work and loving support of family and friends was absolutely wonderful. For us, it was a sign and presence of God’s blessings. Having finished two bedrooms and a bathroom, we moved in on April 3, 2009. It was a whirlwind year of constant prayer, hard work, planning, excitement, fear, laughter, tears, mystery, dying to self and new life. My year of exclaustration (leave of absence) was coming to end. I dwelled on the thought of possibly asking for a one-year extension, but couldn’t bring myself to request it. I felt that I would be using it as a “safety net” and knew in my heart that I was not going to return. I believed that it would have been dishonest to ask for the extension with the intention of never returning. I officially separated myself from the Sisters of Saint Basil the Great in 2009. Through the last five years, we sought guidance and advice from monks and nuns from various monasteries and spent time with them in order to gain first-hand experience of Eastern Monasticism. After countless blessings and struggles, I am now Mother Theodora, named after the martyred Bishop Theodore Romzha, bishop of Mukachevo, Ukraine. 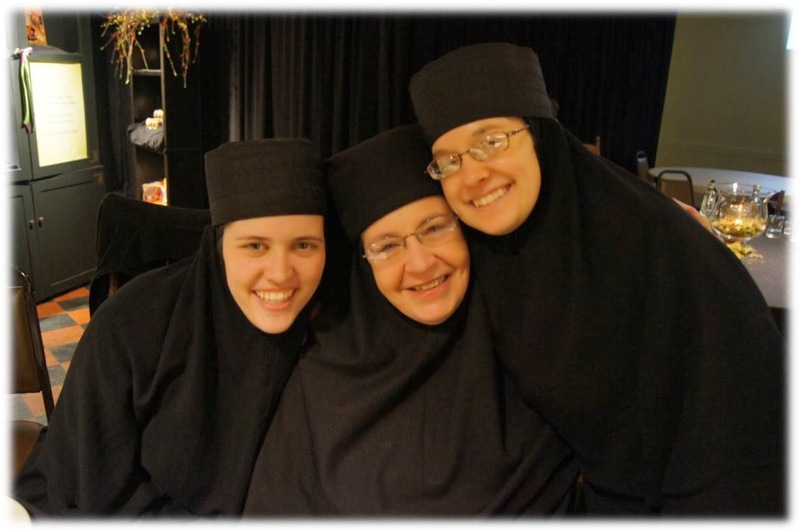 My spiritual daughters, Sister Cecilia and Sister Gabriella (who faithfully worked with us from the very beginning of our adventure) are rasophores (novices) and Jacqui McNeill is a dokimos (postulant). They bring me abundant joy and love. Together we journey immersed in a mystery of mutual love and trust in the One who yearns for union with us and the entire human race. Beautiful story. Mother Theodora, you told me a bit of this story at the Fest, but it was so inspiring to read in its entirety! Beautiful testimony Mother. May your order grow by leaps and bounds. 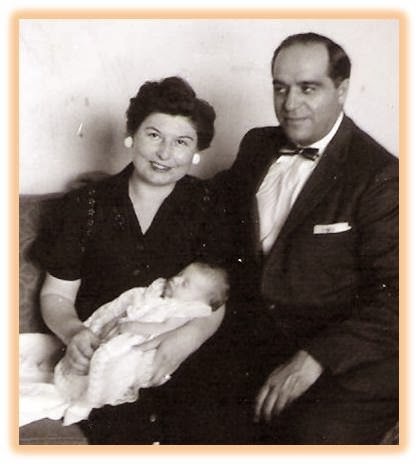 Mother, it is so wonderful to hear more of your vocation story as both a bride of Christ & a spiritual mother! We pray for more 'nuts' like you! ;) Wat a blessing your spiritual motherhood is to our family! LIVE from Mumford Rd Episode 6!